We are already at the world cup after qualifications coming to an end. The value of qualifying for the quadrennial tournament brings more than just prestige, an achievement for those that manage to make it back and literally a way of life for those that feature more regularly. The time it takes to get over a grand moment may not go beyond a fortnight but a disappointment may last indefinitely, if you have been there before. When Argentina failed to qualify for the World Cup in 1970, the fact that they had changed four coaches in three years was not a point to consider, just like no one was willing to listen to Spain’s 1958 Woes. You can’t have a formidable Real Madrid side of that time and fail to qualify for the World Cup. The tale of ‘football’s sad stories’ continue to come through for every year the Tournament is held and nothing has changed about the way passionate fans and players react to failed missions. It’s the World Cup, the only tournament that will divide the attention of commercial links and the game itself just in case anything changes from what is anticipated before the main draw. After Messi and Ronaldo escaping the ‘disaster Zone’ to qualify for Russia 2018, who really got this year’s worst tale of failure? Today, I rank the top five teams that deserved the “national shame” tag and should probably have “Everyone out” by now. 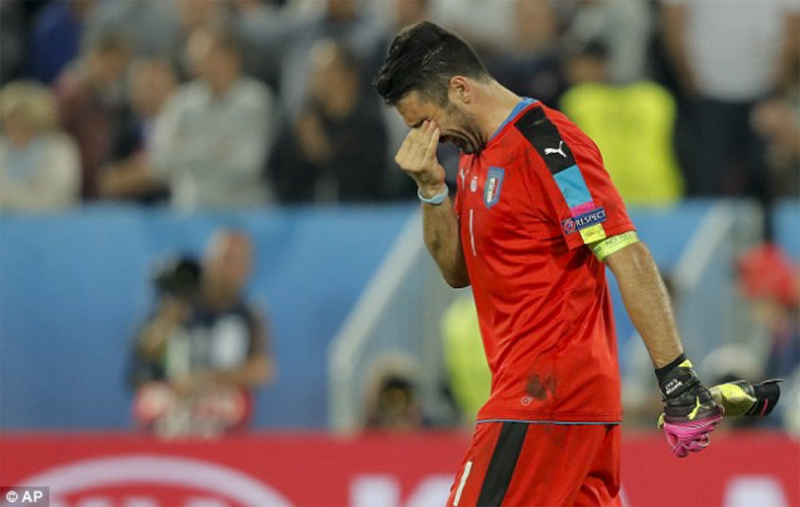 Gianluigi Buffon announced retirement shortly after Italy had fallen from grace against Sweden in the play-offs. 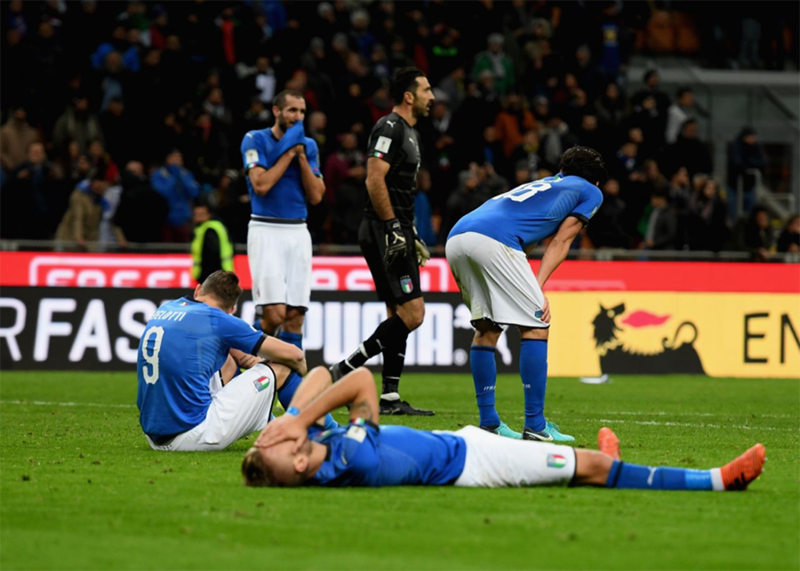 Four-time World Cup winners and third country with the most appearances (14 since 1958), Italy go down as the worst side of this campaign. It could have all started when they were drawn alongside Spain, but it all ended with the appointment of a below par Gian Piero Ventura after Conte’s departure. I must admit Italy are not a side that would threaten Spain in terms of the talent and tenacity for the first time of asking but Ventura should have led Italy past Sweden for a coach’s sake. The 69-year-old looked bereaved of ideas leaving some of his best players on the bench when it mattered most. The Azzurri’s failure to reach the 2018 finals did not only drag down the Italian World Cup Legend but also sent their new logo and jersey down the drain. 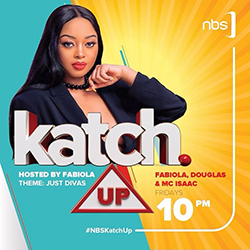 So, where are they going to use their ‘new’ designs from? In 2014, they finished last in a group that had Paraguay, Slovakia and New Zealand, something evident that this was in the making. But who could have guessed they would be missing from Russia? How they responded in terms of restructuring makes them the most pathetic losers. Just like they have been bad over the last few tournaments, they may ‘continue being bad’ because they are no longer the force of old. After winning back to back Copa America Championships and crashing out on the last day of qualification, this was one of the worst performances any country at such a level would have put up. Perhaps worse than their Confederations Cup loss to a young Germany side. The sixth-place qualifier finish, following three losses in the final stretch of four games in the qualification campaign was a massive letdown. 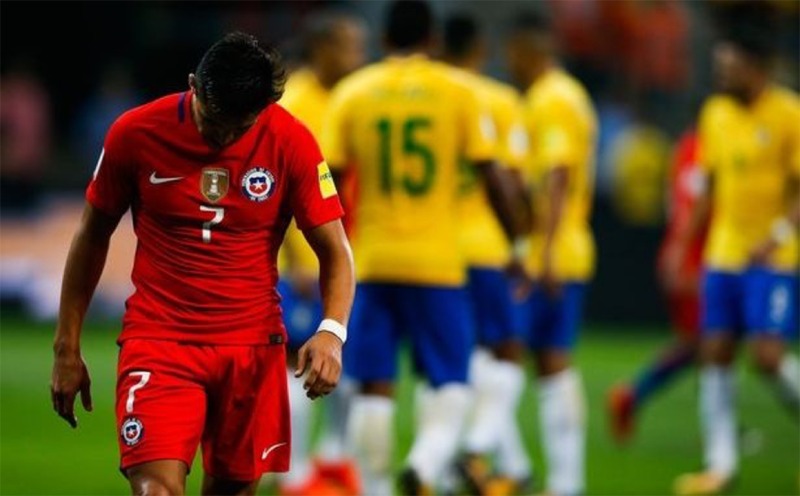 Arturo Vidal, Alexis Sanchez, Claudio Bravo and Gary Medel featuring for the same team and letting go of the spot on the final day in the 3-0 loss to Brazil was the biggest mistake they made. They denied Argentina two-titles but let them occupy their travel space on the road to Russia. Funny how things can turn around but this time, things just flipped against Chile. They should have been good enough to qualify ahead of Peru. 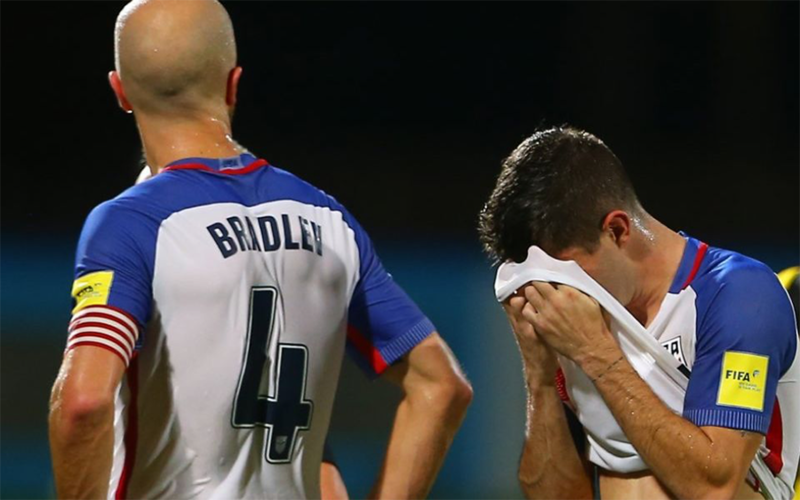 USA players look dejected after failing to reach Russia 2018. For the fact that they lack the moral authority to speak at the highest table of men (forgive my language, I mean Soccer), just like it is politically is no excuse for their failure to qualify for the World Cup. They play in one of the easiest, if not the easiest of all regions there are; but couldn’t beat Trinidad and Tobago and Honduras in the final stretch of qualification. Soccer being ranked as the fifth most popular sport behind the Football, Basketball, Baseball and the likes does not make reason for the failed qualification campaign after massive investment. Only Mexico is better than the US in CONCAF and finishing fifth is just as embarrassing as taking sense out of the ‘Putin-Russia’ jibe when describing the US’ ‘failed elections’. It’s a pity that the Dutch have not benefited from what we can describe as their golden generation of players. Like Italy, Netherlands also had a tough group with France and Sweden. They did not qualify for the European Championship which had the top 24 teams in Europe. Now that would have been a sign that they are below the 24-teams in Europe. The truth is there’s not any young talent replacing the stars that have been around for the long time and already moving out of the team through retirement. Perhaps ‘the gods went Crazy’ pitting the 2010 finalists against euro 2016 finalists and last campaign’s play-offs losers. 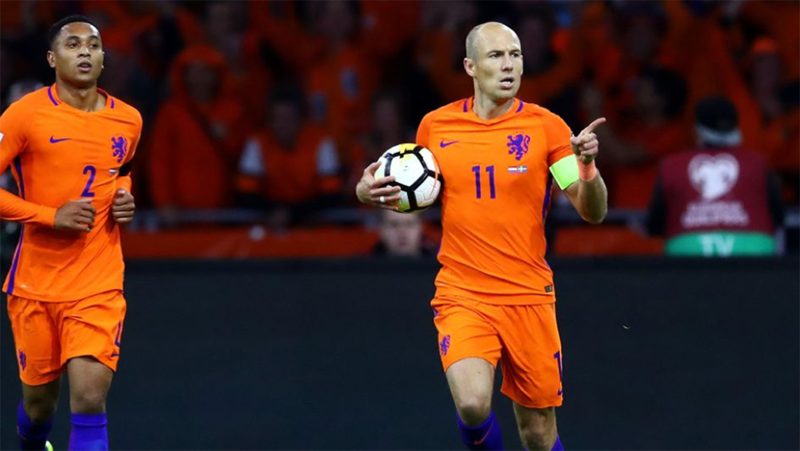 Portugal had their history beefed up with a Euro Championship and are already having a go at the World Cup, but the Dutch’s rich history may have to wait another day for a compliment to come. Are these not the fathers of bad omen? 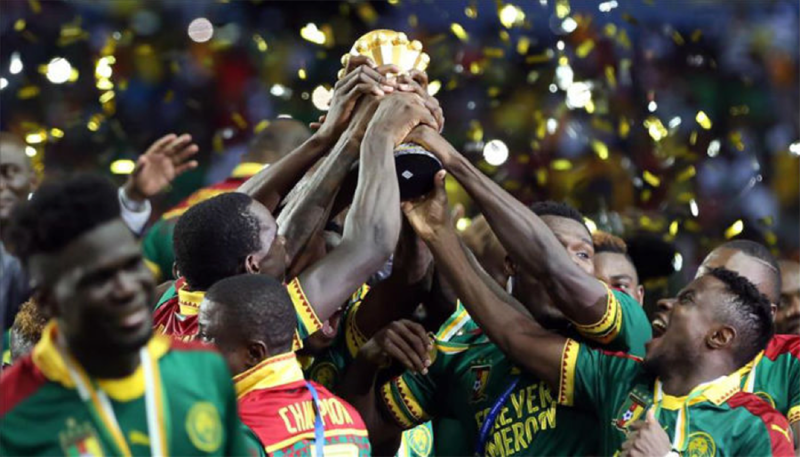 Considered as Africa’s most successful nation at the World Cup; having played at seven main draws and the first Blackman’s country to reach the quarter-finals (1990), Cameroon wraps up this campaign biggest failures. The current AFCON Champions like South America’s also failed to make it to Russia. Having to face Nigeria, Zambia and Algeria in the qualification group was indeed a tough task. However, failing to defeat Nigeria at home and Zambia in their last match was not the best performance from a Continental Champion. South Africa get the honorary mention not for anything serious but for the way they were made to drop the loot they had taken from Senegal in broad-day light. It looked like they had had enough of failing to qualify for the World Cup and had decided to try it their way through the ‘Joseph Lamptey’ qualification campaign. Nothing Can describe how bad it feels losing a spot at the last minute like making this list.